No trike should handle all riding situations the same way. Different handling abilities are needed when riding alone as opposed to riding with a passenger, hauling a trailer, or with added trunk cargo. Choose a trike that gives you the control to maneuver safely in all situations. Motor Trike's patented air ride suspension gives you this control right at your fingertips. 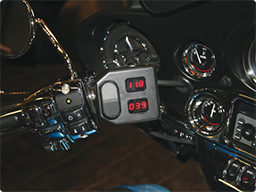 Tune the suspension of your specific vehicle on-the-fly to meet your riding conditions for the ultimately customized ride. The key to superior rideability has always been the ride experience: the jolt of energy and excitement you feel while riding a trike as mechanically sound as a Cadillac. It takes an independent rear suspension with the soundest of engineering and the greatest planning to give you that perfect ride. Find a trike with an IRS that is no less than perfect. Every inch of Motor Trike's IRS was built to account for the inconsistencies of every inch of the road ahead. It was designed to complete a quality product that would lead to quality experiences for years to come. Click here to read more technical information about our IRS. A smooth and comfortable riding trike requires the perfect track width to complement the wheelbase. Get it right, and you have a smooth looking machine that can handle any corner on the open road, or turn on a dime while cruising through the city streets. At Motor Trike, with an already superior IRS, major changes to the wheelbase are unnecessary. The patented independent rear suspension and air ride control were engineered to optimize ride quality and handling with the wheelbase and the track width we have chosen. Don't choose a trike just because it is the longest or the widest. Choose a trike that has a patented and proven IRS designed to handle any road condition and one that still allows you to go on group rides without swallowing the entire lane. Whether buying a car, bike, or trike, you can always tell the difference between a quality built vehicle and one whose assembly was an afterthought. Though a cheaper price point may make the decision easier for you, don't fall for a trike with signs of inconsistent assembly (uneven craftsmanship, missing parts, second-rate material, poor attention-to-detail). Complete in-house assembly is essential to achieving the same high standards placed on every kit and each of its components. Motor Trike's products are both engineered and assembled in our facility, creating a uniformly high quality kit that is then packaged by us and delivered directly to Authorized Motor Trike Dealers. You're choosing a trike that you will ride for as many years as possible with as few service needs as possible. Though every vehicle will need mechanical attention sooner or later, a reliable warranty process certainly helps with those bumps in your triking road. That's why it is important to find a trike kit that will be installed by manufacturer-trained installation teams. Having your kit installed by an authorized dealer means no-hassle maintenance and warranty processes, with more worry-free time enjoyed on the road. Motor Trike is proud to have a dealership network of Authorized Dealers: reputable dealers who have all trained with our technicians at our facility. They understand our product, what standards an installation must meet, and follow through the warranty registration process in person with customers. It takes a family of dedicated dealers who share the same Motor Trike values to deliver a quality product that will last for years to come. How does Motor Trike manage to fulfill all five of these trike buying points? Visit our IRS page to find out! Go to the Dealer Locator and find your nearst Authorized Dealer. Visit the dealerhsip, go on several demo rides, and explore the many add-on options. In the end, the experience of the ride and how it makes you feel is the strongest factor. 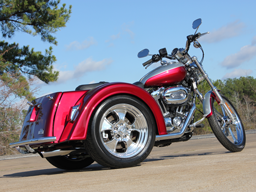 Order your Motor Trike kit and accessories through your Authorized Dealer. They will help you through the purchasing process and will let you know when your kit will be ready to ride home. 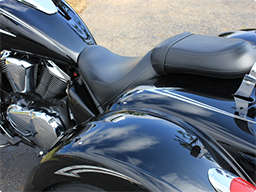 Enjoy superior rideability for many miles to come!